Nottingham Hackspace was the talk of the field at Electromagnetic Field (EMF Camp), a UK maker/hacker camp, held 31 August to 2 September, 2012 at Pineham Park in Milton Keynes. 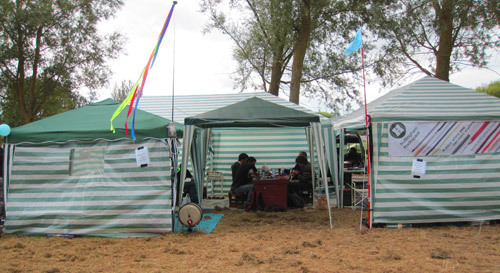 Nottingham Hackspace went with the specific plan to host a “hackspace in a field”, bringing along soldering irons, drills, tools, yarn, knitting needles, crayons and the laser cutter. With 13 hackspace members attending, our village was visited not only by fellow hackspaces, but hosted soldering workshops, worked with the TiLDA badges given to all attendees, and provided a bright, cheerful and welcoming place for people of all ages and skill levels to learn what they could accomplish within a hackspace. Along with running the Nottingham Hackspace Village, members enjoyed the rest of the camp, including blacksmithing workshops, talking about starting hackspaces and how to work towards a greater gender ratio, launching bottle rockets, chatting on EMFM, the camp’s streaming radio station, playing with quadcopters, learning variations on Cat’s Cradle, drinking under an M1 underpass in a post-apocalyptic style bar, and even trying the old Mentos & Diet Coke trick. 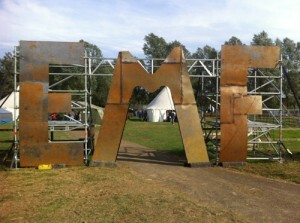 EMF Camp was a fantastic event all around, and Nottingham Hackspace wants to congratulate all the volunteers and organisers who worked around the clock to make that happen. You can see what we did at EMF Camp in our Flickr set, and we’ll see everyone at EMF Camp 2014!